A native of Rapid City, SD, Michael grew up with a strong sense of community and understanding of the challenges facing the local indigenous and underserved populations. This understanding has guided him to implement strong educational programs for all ages and world-class classical concerts throughout the Black Hills and Pine Ridge Indian Reservation. As a graduate of the prestigious Curtis Institute of Music and former member of professional orchestras both in Europe and the U.S. 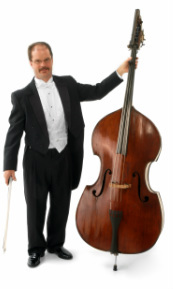 Currently, Michael is the Principal Bass of the Orlando Philharmonic, Principal Bass of Orlando Chamber Soloists, and adjunct professor at Rollins College, University of Central Florida and Stetson University. Michael is one of the most sought after orchestral bass players and teachers throughout the Southeastern U.S. His students have gone on to the top musical institutions including Juilliard and Indiana University. His performance students currently hold positions as Principal Bass of Charlotte NC, Air Force Bands, and perform regularly with orchestras throughout the U.S. such as Atlanta Symphony, Cincinnati Symphony, Pittsburgh Symphony and throughout Florida. His education students hold teaching positions in Hong Kong and throughout Florida.